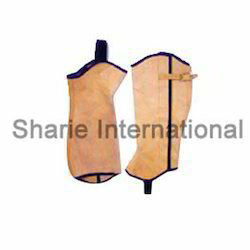 Our clients can avail from us a comprehensive assortment of Riding Half Chaps, which is extensively used mostly in horse shows and by trail riders. Precisely manufactured using optimum grade leather, these chaps are appreciated and acclaimed by the clients for their sweat resistant nature, high wear comfort, perfect fit, tight grip, intact stitch, wrinkle free and other remarkable attributes. To meet the diverse requirements of the clients, we offer these chaps in custom designs based on the details provided by them. Our organization is instrumental in manufacturing and exporting an innovative and durable range of Suede Leather Half Chap. The complete assort offered by us is specifically manufactured employing advanced techniques as per the industry defined standards. Attractive in design and soft in texture, this range can also be availed in custom designs based on the preferences of the clients. 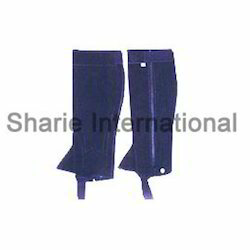 We are mainly looking for Foreign Inquiry..
Leather Half Chap offeredcan be made available by us in an extensive range of choices with finish options comprising Nubuck leather and nubuck foam wrinkle. Made available in size options of Small, Medium, Full, Large, X Large, these are available in any colors as demanded by the customers. Some of its features include stretch leather panel for delivering close contact fit, made of full-grain leather, heavy-duty zipper from outside for closing from top down, provides for exceptional comfort and fit, provide high protection to legs from rubs. Black Half Chap offeredcan be made available by us in different finish choices as well as in excellent quality finish which makes these highly demanded in the market. 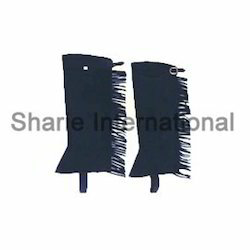 These Black Half Chaps are also highly liked for their attractive finish designs, attractive colors and lasting usage life. Some of it features include wrinkle suede leather chap, available in sizes of Small, Medium, Full, Large, X Large; different color options; appreciated for attractive designs and lasting life; feature full-grain leather outer panel with suede inner panel for delivering close contact with legs; full-length elastic panel for perfect fit; zips from the bottom up. Plain Half Chap offeredcome in plain suede leather finish and can be made available in size options of Small, Medium, Full, Large, X Large. With availability options in different colors, these Equestrian Plain Half Chaps are also washable and come with elastic fitted calf section so as to provide for snug fit. 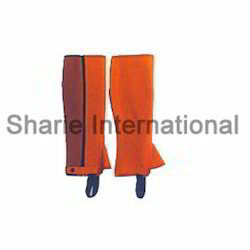 Some of its features include come with extra protective pad on inner leg; elasticated calf for snug fit; press stud-enhanced closures at top and bottom; protective pad on inner leg; available in sizes of XS, S, M, L, XL. Looking for Riding Half Chaps ?